Gather your material. 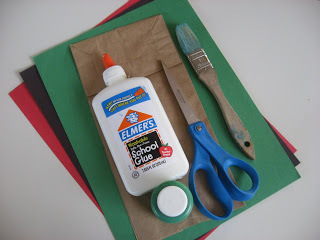 You will need a paper lunch bag, some black, green and red construction paper, glue, scissors, a paintbrush and green paint. 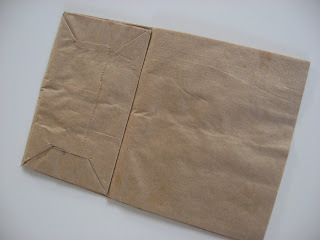 Start by cutting a few inches off the bottom of the paper bag, this will make the bag look more like a short chubby frog! 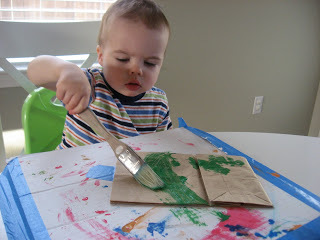 Paint the paper bag with the green paint. 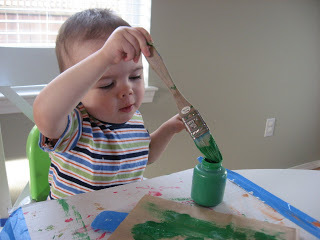 Get more paint and paint the back, and let dry. 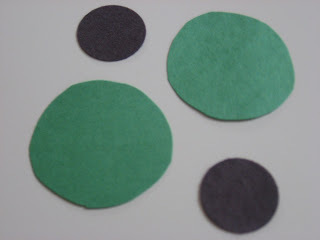 While your child is painting cut out two large green circles, and two smaller black ones. 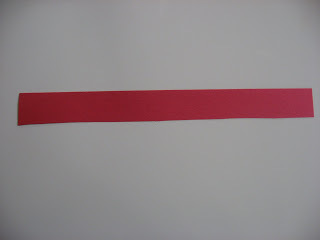 Cut out a long rectangle from the red paper for a tongue. 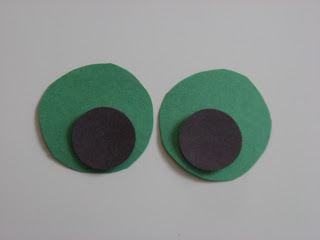 Glue the black circles onto the green ones to make the eyes. 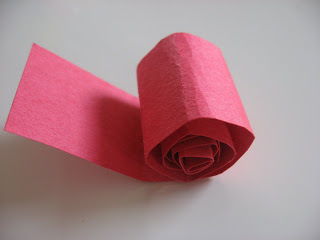 Roll the red paper tightly to make a curly tongue. 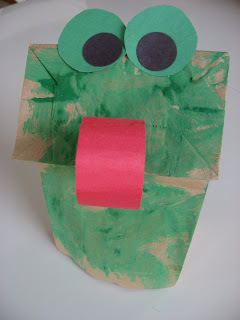 When the bag is dry, glue the eyes and tongue on! 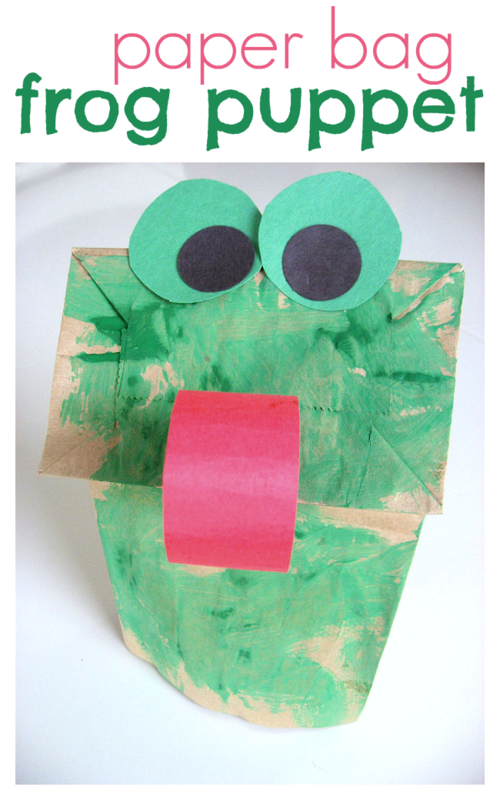 Um um , went the little green frog. and they all went um um ahhh! They don’t go um um ah!!! 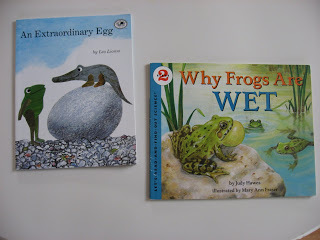 ” Why Frogs Are Wet” by Judy Hawes is good fact-filled nonfiction book all about frogs. This book is great for the 4-5-year-old crowd, but the pictures are wonderful for all ages. The text is long so I would suggest reading a few pages at a time. It covers the evolution of frogs, life cycle and more!” An Extraordinary Egg” by Leo Lionni is a very cute story about three frogs who find a wonderful egg, thinking it must be a chicken egg they are excited to have a new friend when the chicken hatches, even though it’s really an alligator! Kids love this story because they think these are the silliest frogs ever for not knowing that the chicken isn’t a chicken at all! 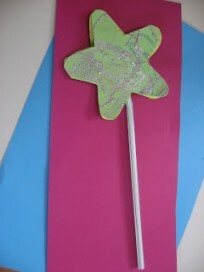 I came across your blog yesterday and have been enjoying all of your activities. Fabulous! My toddler absolutley loves this song and we have watched it no less than 50 times. I was even able to get her to eat dinner tonight by telling her we could watch it again if she would take another bite. Apparently it’s just not the same when I sing it because she keep asking for you again. Hi! 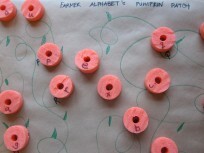 I love this activity, but I have a question for the video of the song (actually all song videos in general). Whenever I press the play button, it says that the video is unavailable so I was wondering if you could tell me if the video is expired or my computer does not cooperate (as usual). 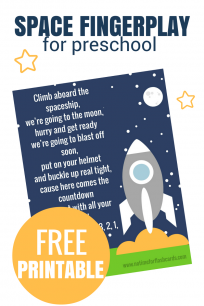 I love doing songs and so does my son and we would love to know the tunes to the songs. Thanks! NO clue why they won’t work but I need to re do all the videos. I promise they are on my to do list – promise! !